Today I want to write about a great long distance runner, the golden jackal. These skinny little jackals grow up to 85 cm long, plus a 25 cm tail. Golden jackals live in small groups made up of a breeding pair and their young from the last year or two. They communicate with each other using a range of calls, including loud howls, barks, growls and whines. They have also been known to live in harmony with other carnivores, including tigers, dholes and Ethiopian wolves. They have a very wide diet, with their food including birds, rodents, reptiles, fruit, insects, small gazelles and carrion. At breeding time, females give birth to between 2-4 pups, although they can have up to 8 babies sometimes. The pups are raised in dens or burrows and both the males and females bring them food. Golden jackals are quite common and have the largest range of any species of jackal, ranging from northern and eastern Africa, southeastern Europe, through the Middle East and Asia as far as Burma. They can be found in deserts, forests and even on the edges of towns. 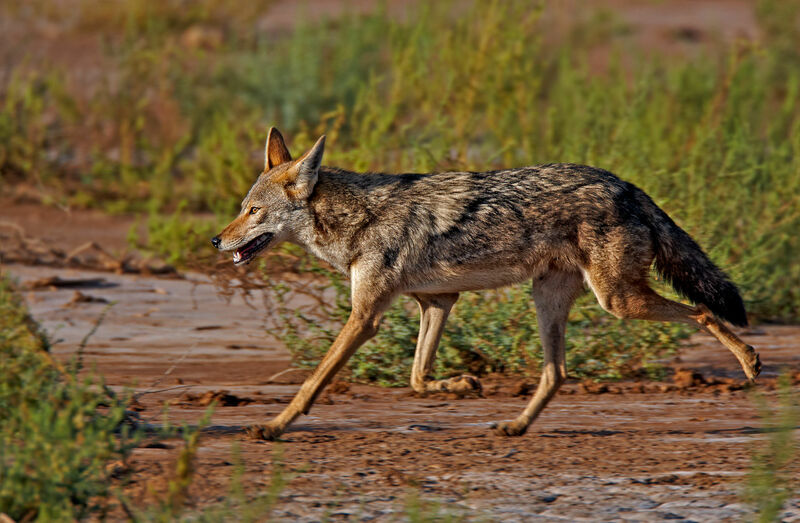 Are there any other interesting facts that you would like to share about golden jackals?